Healthcare organizations are able to send and receive relevant data in real time for a single patient in industry-standard documents, providing caregivers a more complete picture of patient health, which leads to more informed treatment decisions and better coordination of care. by exchanging a summary picture of patients' health and care in an accessible and readable format. Learn more. Clinical Document Exchange allows you to determine the correct document type to receive and send patient health information to meet your objective. 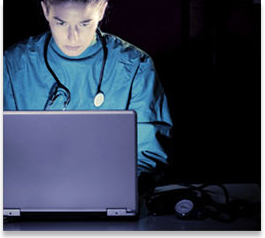 by querying and viewing patient information when the physician, patient, or State agency, etc. need it – day or night. Exchange comprehensive, relevant, readable patient data in real time. 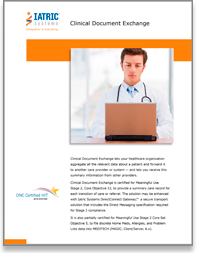 Learn how Clinical Document Exchange can help clinicians provide better care. Certified to meet Meaningful Use Stage 2 Core Set Objective 12, to provide a summary care record for each transition of care referral. The inbound portion of Clinical Document Exchange can assist the hospital in meeting Meaningful Use Stage 2 Core Objective 5 by making data available for reconciliation. Sends and accepts data in many document types: HL7 Clinical Document Architecture (CDA), Continuity of Care Document (CCD), Healthcare-Associated Infection (HAI), Continuity of Care Record (CCR) and more. to secure the sharing of health information using the Direct Messaging specification that is required by Meaningful Use Stage 2. 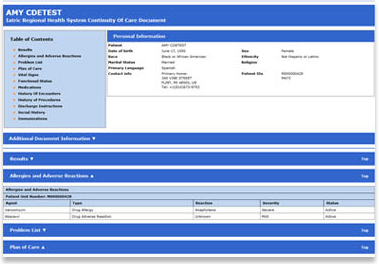 Receive notification once the patient’s medical summary is available. Create flexible business rules to accommodate each hospital’s specific workflows. 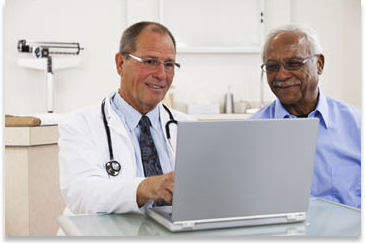 Communicate easily with EMR systems, Record Locator Services, and send and receive Personal Health Records (PHRs). Clinical Document Exchange, version 1.5, has been certified on November 1, 2018, certification number is 05.05.2760.ISCD.01.00.1.181101. Clinical Document Exchange is ONC 2015 Edition compliant and has been certified by SLI Compliance, an ONC-ACB, in accordance with the applicable Eligible Hospital certification criteria adopted by the Secretary of Health and Human Services. Clinical Document Exchange, version 1.5, meets the following certification criteria: 170.315(b)(1) Transitions of Care; 170.315(b)(2) Clinical information reconciliation and incorporation; 170.315(b)(6) Data Export; 170.315(d)(1) Authentication, Access, Control, and Authorization; 170.315(d)(2) Auditable Events and Tamper-Resistance; 170.315(d)(3) Audit Report(S); 170.315(d)(5) Automatic Access Time-Out; 170.315(d)(6) Emergency Access; 170.315(d)(7) End-user Device Encryption; 170.315(d)(8) Integrity; 170.315(g)(1) Automated Numerator Recording; 170.315(g)(3) Safety-Enhanced Design; 170.315(g)(4) Quality management system; 170.315(g)(5) Accessibility-centered Design; 170.315(g)(6) CCDA Creation Performance. The additional types of costs that an Eligible Hospital would pay to implement the Clinical Document Exchange version 1.5 in order to attempt to meet meaningful use objectives and measures include: relevant hardware if not already available. ONC CERTIFIED HIT® is a registered trademark of HHS.